Safety is given primary importance in planning and operating all company activities. Accordingly, it is company policy to place safety and health on an equal basis with quality, productivity and costs of providing services. We don't just say it, we do it. Precision Environmental Company's safety and training program requires its workforce of 250-plus employees to continually upgrade their skills and improve productivity. Training programs at a minimum include asbestos, lead, hazardous waste operations ( HAZWOPER ), confined space, confined space rescue, powered industrial trucks, aerial lifts, lockout/tagout, fall protection, scaffold erection, excavation, and OSHA 10 and 30-hour for Construction. Re-certification and upgrading are constantly ongoing. Precision Environmental Company is recognized as an industry leader for not only its quality of work but also for its safe work history. Since 1987 Precision has submitted over 4,000 notifications to the Ohio Department of Health. We have increased our annual hours worked to over 500,000 while maintaining a Experience Modification Rate ( EMR ) well below the industry average (<1.0) for nearly two decades. Additionally, we have received safety performance awards from the Construction Employer's Association for six consecutive years and have been recognized as Safety Contractor of the Year by NASA Glenn Research Center. 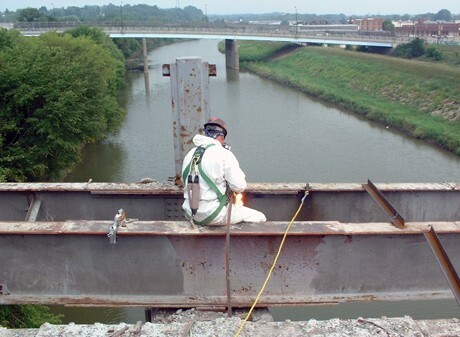 Precision Environmental has also been annually recognized by ENR (Engineer News-Record) as one of the top asbestos environmental contractors nationally. We enforce a corporate policy against the abuse of drugs, controlled substances and alcohol, and have been enrolled in the Ohio BWC's Drug-Free Workplace Program for the past 10 years. In addition, all Precision employees must submit to a pre-employment and an annual 12-panel drug screen or be enrolled and eligible to work per the Construction Industry Substance Abuse Program. "I would like to congratulate you on your selection as a winner in the Contractor Safety Award Program. Your safety record for 2008 demonstrated an excellence in safety in achieving at least 335 points out of the possible 410 points [..] on the application. This year the criteria for consideration, was not based on your numbers alone. The program evaluated the Days Away Rate, the Days Away, Restricted, or Transferred (DART) Rate, and the Total Recordable Rate along with the other criteria concerning your safety and health efforts on the application. Each question on the application is weighted so that the award is not based on the rates alone, but on your company's safety and health efforts."